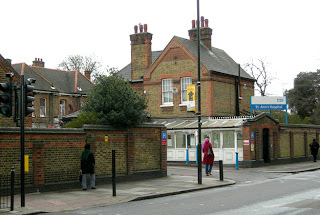 Haringey Green Party Blog: Haringey Needs St Ann's Hospital! Haringey Needs St Ann's Hospital! Haringey’s last hospital is under threat. Plans to redevelop the St Ann’s Hospital site have been rumbling on since 2006. Now, as the managers of the site, Barnet Enfield and Haringey Mental Health Trust (BEHMHT) are preparing their application to get Foundation Trust Status in 2014 the redevelopment plans have been developing rapidly. To get Foundation Trust status – which is another step towards the marketisation and privatisation of the NHS – BEHMHT needs to ‘balance its books’. They claim the site is underutilised, has poor facilities and is costing them £7.5m a year to maintain. They say the only way they can afford to provide the healthcare facilities we need is to sell off two thirds of the site to property developers. We say we already pay for universal healthcare out of our taxes, we demand healthcare facilities that meet the needs of local people now and for the foreseeable future. We don’t see the site as a liability – it is an asset that needs protecting. From an early stage it was evident that BEHMHT’s finances were driving the agenda, not the needs of local people. They proposed moving the mental health inpatient wards from St Ann’s to Chase Farm Hospital in Enfield. Mental Health Campaigners pointed out that this would lead to the isolation of people with mental health problems as friends and carers would have to travel miles to visit their loved ones. The plans were challenged in two internal NHS reviews. Both concluded that the campaigners were right and BEHMHT were wrong. They had to change their plans and include new wards in the redevelopment plans. If BEHMHT got this wrong how can we trust the rest of their plans? In 2011 BEHMHT set up a Community Reference Group (CRG) to ‘involve’ local people and patients in the redevelopment plans. We were encouraged to do some ‘blue sky thinking’. We said we wanted a fully functioning District General Hospital with an A&E department. They said this was unaffordable but never produced any evidence to justify the claim. The group has been meeting for nearly two years now and we have never been allowed to discuss health care needs. We’re beginning to think that the group is just a convenient way for BEHMHT to tick their ‘community involvement’ box while they continue with their plans to sell off the site and leave us with inadequate facilities. We demand an independent healthcare needs assessment. We want to know what the community needs now and in the future, we can talk about how its going to paid for later. We don’t agree that the site is a liability, we think it’s a community asset that needs to be protected. How can BEHMHT claim that the site is ‘surplus to requirements’ without the evidence of a healthcare needs assessment and a thorough exploration of alternative options that could improve the health of local people? The local community are already articulating their needs. Mental Heath Campaigners have argued that the current facilities are stigmatising and inadequate. In addition to the inpatient wards we need comprehensive primary care, outpatient facilities and ‘recovery houses’ on site – places where the focus is on the prevention of acute episodes and the transition between services is a smooth one, not the traumatic experience it can be now. The government has said that mental health should have the same priority as physical health, we demand that this pledge is put into action on the St Ann’s site. If BEHMHT and the new GP commissioners of NHS services, Haringey Clinical Commissioning Group (HCCG) really cared about our health in the future they would pay more attention to the welfare of our children. Haringey has one of the worst records for child development by the age of 5 in the country. This is unacceptable. We must ensure that everything possible is done to avoid tragedies like Victoria Climbie and Baby P ever happening again. Child Development Services on the St Ann’s site are currently provided by Whittington Health. They propose a new Child Development Centre on the site, one that brings together Health, Local Authority and Mental Health services, integrated to focus on the needs of the child irrespective of organisational boundaries. Local Councillors have expressed support for integrated services, but what has happened? Nothing! We demand the best possible children’s services, nothing less is acceptable. Hospitals can be significant drivers in local regeneration. In addition to the health services they can be a place that provides jobs and training for local people and attract other services and community facilities. We want a hospital that is the pride of our community, not just a collection of disparate services shoved into the corner of the site so that BEHMHT can offload its ‘liability’. These are just some of the proposals that we know of. What do you need? What do you think should be provided on the site? What can improve the health of local people and reduce health inequalities in the borough? All welcome - please come and help campaign for local health services we deserve and need! St Ann's Hospital is our local health service provider. We should be developing and improving it for all local people. Despite repeated calls for the health services on the site to be based on an assessment of local health needs we are hearing proposals that the same services could operate on a much smaller site with private companies taking over other areas for their own needs and profits. This is unacceptable! We demand health services that will improve our health now and for our children's future needs. Please come to the meeting and help campaign for the excellent health services we deserve and need in Haringey!